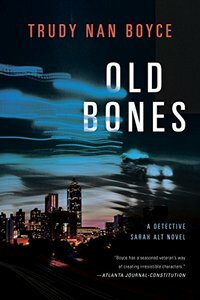 Old Bones by Trudy Nan Boyce, a Mysterious Review. Review: Atlanta is in turmoil. There has been a drive by rifle shooting of students who were participating in the “Take Back the Night” vigil calling for police reform at the Spelman College, in Old Bones, the second mystery in this series by Trudy Nan Boyce. One student was dead at the scene and eleven others were wounded. On her way to interview the witnesses, Detective Sarah “Salt” Alt chased the fleeing vehicle of the suspects, but they got away from her. Inasmuch she was already assigned to a case of a recently discovered decomposed body, other officers took the lead on the Spelman case. From a missing- persons report it becomes obvious the victim is Mary Marie McCloud, a young girl that Salt had taken into custody two years ago when she was still a police officer on the beat in a run-down area called “The Homes”. In that section of town there were drug lords, prostitution, illegal gambling, and other illicit activities going on but no-one would testify against the “bosses” for fear of their lives or the lives of their loved ones. Salt patrolled those streets for ten years so knew who was who even if she could not prove it. And, they, of course, knew her. In a odd way, Salt felt responsible for Mary Marie’s death. But before she could begin pursuing any leads, she was called into emergency riot detail to attempt to control the assault on the students at Spelman. Rioting and looting began to take over. Atlanta had reached its boiling point. The police were put on twelve hour shifts. And if that weren’t enough, Salt must deal with the department’s psychologist as he needed to determine a right-of-fitness evaluation for her go back to active duty after being involved in two use-of-a-lethal-force incidents within the last year. She had been wounded and still experienced major headaches. On the personal side there was stress from the question of Will, the man she hopes to marry. They had been lovers for the last two years. They have had to keep their relationship a secret which they had been successful in doing so far, or they would be scheduled different shifts or even different tours of duty. Salt is a determined woman, dedicated to her profession yet eager to start a new life with Wills. But she has a case to solve. Who killed Mary Marie and dumped her body in squalor two months before. Why didn’t someone report her missing? She was only fourteen years old. To find these answers Salt had to go into the past at The Homes, reliving the horrors of the times. The recurring and other principal characters in Old Bones are engaging and crisply drawn. Too, the diverse supporting case is very interesting, most of whom are in the Homicide Division and include Rosie, the transgender receptionist and a couple of proud gay officers. The story is a strong one, topical, and well-structured. Though this is only the second book in this series, both are solid and both recommended. Special thanks to guest reviewer Betty of The Betz Review for contributing her review of Old Bones. Acknowledgment: Penguin Group provided a copy of Old Bones for this review.